Designed for comfort and performance at higher temperatures and optimal waterproof protection in rainy conditions. The Sauris D-DRY® jacket is designed to ensure comfort and performance at higher temperatures while providing optimal waterproof protection in rainy conditions. Thanks to its 70% highly ventilated mesh this jacket is the perfect choice for mid-summer road touring, even on the hottest itineraries. The 20.000 mm waterproof and windproof D-DRY® over shell is a shelter from the bad weather, allowing the rider to continue enjoying the journey and never be caught unprepared in case of thunderstorms or sudden cold situations. 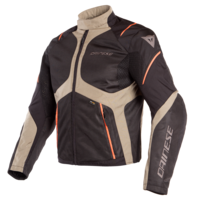 Cordura® fabric, D-Stone™ inserts on high impact areas, removable composite protectors on shoulders and elbows, and pockets for back and double chest protectors guarantee the Dainese safety standards.